It has become a sort of Ukrainian tradition – the closer sequent elections are, the more stressful matter about Russian BSF staying in Crimea becomes. Here comes pre-election presidential race which can't go without debates on this subject. 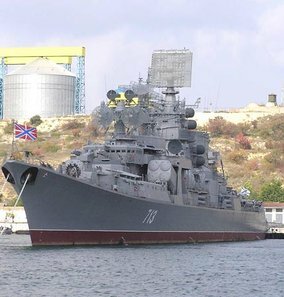 Some presidential candidates are hostile to probable prolongation of Russian Navy presence at the peninsula; others are less peremptory and connect further staying of Russian sailors in Sevastopol with benefits to Ukraine. Let us try to find out whether the compromise is possible here. We begin with current finance aspects of Russian naval force presence in Crimea. 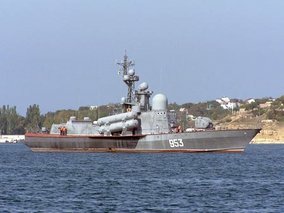 According to Agreement of mutual exchanges signed on May 28, 1997 and related to separation of Soviet Black Sea Fleet and basing of Russian BSF at Ukrainian territory, annual lease payment for land and coastal infrastructure objects, harbor basins, radiofrequencies and compensation for ecological deprivation makes $97.75 mln. In addition, Russia participates in socioeconomic development of populated areas at fleet's basing sites. These are Sevastopol and Feodosiya cities and Gvardeiskoye settlement. About $5 mln is annually appropriated for that, including about $4 mln for Sevastopol. Additionally, only in 2008 the Black Sea Fleet transferred to different budgets over $70 mln taxes. It is well to bear in mind military payments to Black Sea Fleet servicemen (over $104 mln) and salaries of employees of factories, organizations and institutions ($80 mln approx; over 20 000 civilians were employed at BSF in 2008, primarily Ukrainians). These monetary assets stay in Ukraine in one form or another as are spent on purchase of various products or services. Thus, current Russia's total expenses on Black Sea Fleet make over $350 mln per year. For comparison, annual income of Ukrainian government budget is evaluated as $45 bln, Sevastopol budget income makes about $160 mln per year. Meanwhile, the latter's greater part consists of personal income tax. According to current agreements, Russia leases about 18 240 ha of land in Crimea and Sevastopol for the needs of its Black Sea Fleet what makes 0.03% of Ukraine's overall area (603 700 square km). Simple calculation shows that income to Ukrainian budget from one hectare of land leased by Russian BSF makes $5359 per year, while average parameter over Ukraine is $745.4, i.e. 7.2 times less. Let us settle upon one significant nuance. Over two thirds out of 18 240 ha leased by Russia for BSF bases are the territory of ranges and test centers being used 3-4 times per for 4-6 weeks in total. Besides, the portion of military camps is currently not occupied and obviously more areas will be released due to Navy reformation program. Therefore, around 5-6 thousands ha would be enough for adequate operation of Russian Black Sea Fleet; mostly, in Sevastopol (about 3 500 ha) – BSF main naval base, airfield in Gvardeiskoye and several objects in Feodosiya. Suppose, the Russian Black Sea Fleet would be withdrawn from Ukraine in 2017 – obviously, it is necessary to seek for new ways to develop its current basing sites as early as now. Mostly, that's a great deal for Sevastopol. What Sevastopol needs to stake on today? Development of resort? Port? Or maybe industry? In opinion of the program developers, Sevastopol would become a large tourist resort area in nearest future. Measures related to granting the city a status of governmental health resort were planned to be realized in extremely short period – in 2007-2009. Prime costs would be associated with renovation of city infrastructure. In particular, bridge construction over Sevastopol Bay, Belbek Airport, one more bus station, belt highway, road tunnel, traffic arteries, trackless lines. The program provided purchase of transport, reconstruction works on Sevastopol commercial seaport, construction of ferry, sewage conduit and water treatment facilities. A program providing development of Sevastopol as world's tourism and recreation centre was developed few years ago. The reason was following: "Many countries live off the tourism. We got history, climate, nature, communications – everything! Why don't we develop tourism?!" Those who had been to Sevastopol know there are no much potential at tourist drift there. Moreover, prioritizing only resort vector is at least an economical improvidence. First, short holiday season (not more than 5 months) is not pretty attractive for hotel industry investors. Second, none even four-star hotel have been built in Sevastopol during the last 18 years. Meanwhile, analytic centers of such corporations as Hilton, Swissotel, Marriott are permanently seeking potential recreation zones worldwide and offer their projects. They haven't offered anything to Sevastopol. And if tourism becomes Sevastopol's budget-forming priority, where will citizens work? Waiters, housemaids, dishwashers? As is known, Ukraine has a great port potential. There are 18 commercial sea ports and 12 sea terminals on the coast of Black Sea and the Sea of Azov apart from numerous private ports and quays. However, so far Ukraine could not achieve significant growth of its own foreign trade volume and transit cargo volume either. Almost all Ukrainian ports yield to foreign competitors as for volume of works and quality of service. Despite the fact that Sevastopol is the only Ukrainian's unfrozen port with natural depth of harbor channel not less than 17 meters and over 280 Soviet-inherited power-supplied quays with overall length of 20 km, it is quite difficult to use it as a port. One of the principal problems of Sevastopol port is its closure with city borders. As experts say, in these circumstances Sevastopol needs about $4.5 bln of direct investments only to develop piers and harbor capacity. It is well known that nowadays all Ukrainian ports are behind their foreign competitors regarding scope of work. Reasons of such losing lie in the following facts. First of all, noncompetitive price for harbor services. Comparing cost of Panamax-class vessel call at Nikolayev, Odessa or Sevastopol with same parameter of Constanta port, the latter is obviously without a rival. By the way, berth depths and loading rate of Constanta are much greater then in Ukrainian ports; that enables to accommodate great-tonnage vessels faster. Second, expensiveness of Ukrainian logistics makes owners of transit cargo skirt Ukraine and call at Russian and Baltic ports. Third, railroad rates and shipcall costs are not regulated by market in Ukraine. In fact, those who form transport component of product price in Ukraine (sea and river ports, Ukrzaliznytsia Railway Company) cornered the market and respect only own interests while fixing prices, tariffs and fees. Currently, cost of railway cargo delivery from Ukraine's core areas to domestic seaports is comparable with shipping cost of same cargo from Ukrainian ports to the USA by sea. Considering Sevastopol as a sort of high-tech industrial center, it is unfortunately obvious that such largest plants as Musson, Mayak, Parus have kicked the bucket long ago. 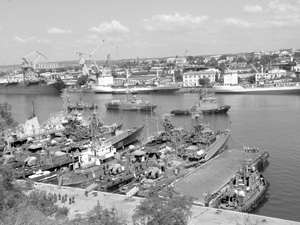 Almost same happened to Sevastopol's pride – Sevmorzavod, a huge fishery complex in Kamyshovaya Harbor, which had annual fishing output over 200 000 tonnes and employed up to 10 000 sailors as early as 1990-ies. Scientific potential of the city, particularly KrymNIIproekt, Krymmorproekt, Azcherryba Central Design Bureau, Institute of South Seas Biology, SovNIIT, Gidrofiz, Chernomorets Central Design Bureau, Korall Central Design Bureau are on the down-grade. What are the solutions of such complicated situation? And what may Russia offer in exchange for prolongation of Black Sea Fleet presence at Ukrainian territory after 2017? First of all, increase of lease payment. There were different Ukrainian proposals varying from $1 bln to $5 bln and sometimes to $10 bln per year. As per Russian officials, the variant of lease payment increase is possible but only after 2017. Cooperative improvement of land plots and property released due to Russian Navy reformation could be an important trend. It might be launched in advance of 2017. Preschedule release of those lands could be used for Russian-Ukrainian intergovernment projects. This would give Sevastopol a specific look. Russia could invest creation of recreation zones, building hotels etc. For instance, BSF Concrete Product Plant 24 is located near Great Sevastopol Harbor boom. Not discrediting the importance of that factory, it would be better to find more proper place for it and use released area for Russian-Ukrainian five-star hotel complex as there are plenty of space for that (11.08 ha). Another example. Russia concerns about preservation of Sevastopol's holy places like the Chersonese. It would be a bilateral project of reconstruction and preservation of this unique memorial. There are number of military units located near traces of an ancient city. Their relocation would hardly destroy combat readiness of Black Sea Fleet, while territorial expansion of museum and building of hotel would benefit much to Sevastopol. Wider partnership is possible in humanitarian and scientific areas as well, for example, establishing joint Russian-Ukrainian University on the basis of Black Sea branch of MSU under the auspices of Lomonosov Moscow State University and National Taras Shevchenko University of Kiev. Branches of key Russian and Ukrainian universities may be located on the territory of former Lazarev barracks where Black Sea branch of MSU and some military units are currently located (after relocation of the latter, of course). This would enable to establish compact joint scientific and educational center with student quarters. Another place of joint efforts application could be BSF Naval Hospital 1472. With its highly professional staff and unique equipment it is absolutely capable to become a basis for Russian-Ukrainian medical scientific center. For this purposes, it would be possible to consider integration of Russian Black Sea Fleet medical institutions and Ukrainian Navy's ones. Russian and Ukrainian sailors could take treatments in same center, as well as veterans of the Great Patriotic War and Labor, Sevastopol citizens and vacationers. This center might be used for training medical specialists as well. Joint upgrade of the city could be continued in environment protection and ecology. As it known, reconstruction of treatment facilities has become an exigency now. Some bays could be demilitarized and used in other views. Military and technical cooperation between the two countries could be even more important trend. Russia needs to renew Navy's vessel fleet – Admiral Vladimir Vysotsky, RN Commander harps on it repeatedly. Obviously, domestic shipbuilding capacities are insufficient to meet Navy's demands. Civil vessels need renovation as well. We recall that in Soviet epoch almost all classes of surface ships were produced at Ukrainian shipyards: heavy aircraft carriers, scout and auxiliary ships, missile cruisers, large ASW ships, SR vessels for submarines, corvettes, coastguard ships, gunboats, small ASW ships, research vessels, dynamically-supported combat ships, fast patrol boats, support vessels, composite floating docks; upgrading and overhaul of non-nuclear surface ships were performed there as well. In Soviet times military customers (domestic and foreign) every year received a whole squadron (up to 30–35) of new and upgraded ships: 2 large ASW ships; 8–12 hydrofoil vessels, air cushion ships etc; several vessels were overhauled and modernized. Furthermore, once in 3–4 years Soviet Navy received an aircraft carrier capable to carry up to 50 aircrafts and armed with missile system with 12 missiles; missile cruisers with 16 CMs. Civil customers annually received 50-60 different vessels: 8–10 large freezing factory trawlers, 5–6 refrigerator vessels, 20–24 medium fish trawlers, up to 10–12 large cargo ships, up to 10–12 hydrofoil vessels. About 130-150 thousands of specialists worked at dozens shipyards, ship-like engineering and instrument-making plants, design bureaus, scientific and research organizations, educational institutions and other cooperative companies. Shipbuilding industry determined quite high socioeconomic level of south Ukrainian cities (Nikolayev, Kherson, Kerch, Sevastopol etc). Welfare of half a million citizens depended on efficient shipbuilding. Obviously, Ukrainian shipbuilding branch had certain drawbacks. They were related with the fact that significant portion of scientific research projects realized by Ukrainian shipwrights was developed in Leningrad (St. Petersburg). Greater part of vessel projects was designed there too. In addition, number of constituent parts, instruments, equipment and armament was produced in other USSR republics. This fact motivates high import dependence of Ukrainian shipbuilding. It must be also considered that present Ukrainian shipbuilding have not own financial sources for its urgent renewal. Supposedly, in these conditions military technical cooperation with Russia is what could give an impulse to Ukrainian shipbuilding and place it on new level. Russia could undertake development of new warship projects involving Ukrainian shipbuilding capacities. Every year Russian Navy would be able to purchase up to 10–15 combat vessels placing multibillion orders and employing tens of thousands Ukrainians. Ukrainian Navy could also order such ships. Additionally, Russia and Ukraine could jointly promote these projects to foreign partners like China, India etc. As for Capt Alok Bhatnagar managing the naval program of Indian Defense Ministry, 32 combat ships and submarines are currently under construction at domestic shipyards. The work on 75 ships including aircraft carriers, destroyers, frigates and amphibious ships will be launched within 10 years. According to naval officials, India faces "strategic necessity" of creation own shipbuilding capacities and primarily counts on Russia in that matter. India will appropriate 200 bln rupees ($4 bln) per year for Navy development and about 60% of them for equipment procurement, said Admiral Surish Mekhta. Russia could more actively participate in socioeconomic development of BSF basing sites. By some estimates, contribution of Russian investments to these settlements' budgets could make 15–20%. And, of course, one should consider taxes to different Ukrainian budgets, disbursement and salary paid to employees working at various BSF plants, organizations and institutions; all these monetary assets remain in Ukraine in one form or another. Western experts say that Ukraine needs 100 bln euro to spend in ten years for full-scale reform. Population of Sevastopol constitutes about one percent of Ukraine's one. Forming a proportion, it becomes obvious that the city should attract 1 bln euro investments. However, calculations given above show this sum would not be enough for Sevastopol. Supposing that lease payment for basing of BSF is $1 bln per year (minimal price mentioned by Ukrainian politicians), Ukraine's budget could annually be recharged at least on $2-3 bln (5-7%) just as a result of cooperation with Russia on matters mentioned. Moreover, shipyard sites and population centers at BSF bases would get additional income to their budgets. Let us clear up whether those conditions are reasonable for Russia or not. Economically, for Russian Federation it is more profitable to lease Crimea bases then place the fleet on Russian Black Sea coast. There are several reasons for that. First, Ukraine already has necessary infrastructure. Second, Russia possesses insignificant zone of Black Sea coast and climatic conditions at potential basing sites are sometimes very severe and unsafe. Third and foremost, relocation of Black Sea Fleet from Crimea to Russia would keep down possibilities of merchant shipping. It is known that apart from Novorossiysk there are no large port terminals at Russian Black Sea coast. Enlargement of commercial ports would multiply cover leasing expenses of Black Sea Fleet. As for additional space for merchant shipping released by withdrawal of Russian BSF, it might be unlikely significative for Ukraine. First, because of fair number of ports at Black Sea and Sea of Azov coasts. Second, due to difficulty of cargo delivery to Sevastopol by rail (Simferopol-Sevastopol line is mostly a one-track railroad passing through variety of rock tunnels). It should not be overlooked that naval and merchant port infrastructures are different in kind. In particular, military infrastructure does not include huge area at coast quayage, while it is determinant for civil commercial fleet. Construction of such port facility needs additional and quite considerable investments (experts estimates were mentioned above). Obviously, such partnership would be beneficial both for Russia and Ukraine. It would form new look of Sevastopol turning the city into one of the largest scientific and cultural centers at Black Sea region. A new impetus would be given to Ukrainian shipbuilding resulting in reduction of unemployment and welfare of thousands of South Ukrainians. Furthermore, such cooperation would help Ukraine to create an image of authoritative Eurasian actor and recover its global competitiveness and attractiveness. Copyright © 1998-2012 RusNavy.com. All materials contained in this Website are protected by copyright laws and may not be reproduced, republished, distributed, transmitted, displayed, broadcast or otherwise exploited in any manner without the express prior written permission from the editorial staff. The editorial staff. Site created by ProLabs. Russian version.